All new 78 minute program with a Hudson Type Historical Overview, 1940's steam along the Hudson River + electric powered passenger trains in that area. Then, the last of steam around Bay City on the Michigan Central 1954-55. On to Detroit and Toledo in 1955 with Hudsons on passenger trains. 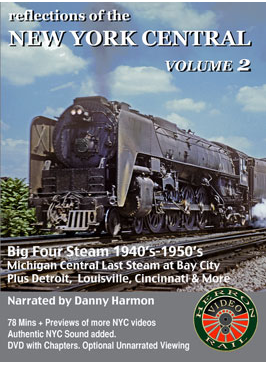 Next, Big Four Route steam in the 1940's and '50's in Ohio at Delaware, Springfield, Dayton and the surrounding area with Niagaras, Hudsons and Mohawks on passenger trains and Mohawks at stations and running fast plus Mikados on freights. Then, NYC's last steam at Cincinnati in 1956-57 with Mohawks, Mikados and both 6 and 8 wheel switchers. You'll visit the roundhouses at Cincinnati Union Terminal, Riverside Yard and L&N's DeCoursey yard where NYC was delivering transfer runs. The program is 78 minutes plus previews of Volume 1 and our other NYC videos, 90 minutes all together! Narration is by Danny Harmon and you can choose either narrated or un-narrated viewing from the DVD menu. 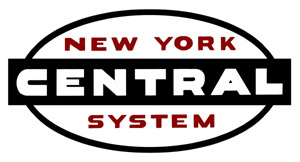 We've added real NYC sound recorded in the 1950's to bring the film to life. This is an action packed program you won't want to miss!